If your current timer is still printing results and taping them to a board, then your race is badly out-of-touch with contemporary life in a modern world. 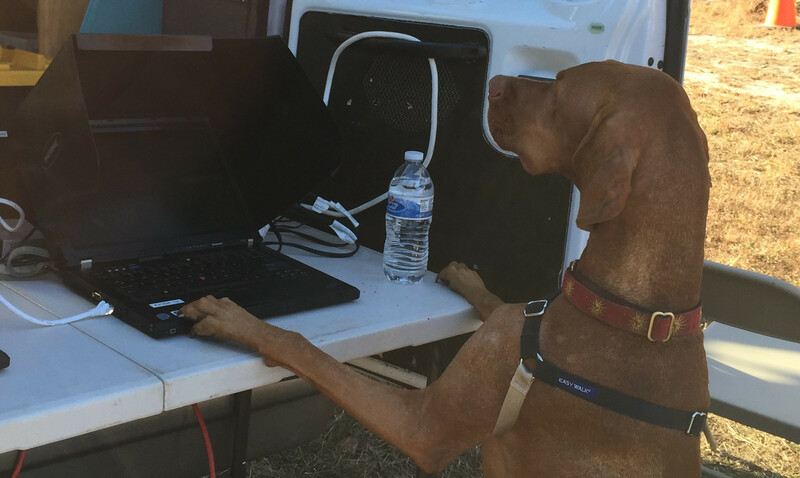 Even Phoenix the dog preferrs SpectaSport's instant results kiosks! By the way, the photo on our home was not staged. Phoenix watched the human entrants at the kiosks. When there was nobody else at the kiosk, Phoenix stood up to the kiosk without any prompting, put his paw on the mouse, and stared at the monitor for a good 30-45 seconds (just long enough for another runner to capture this photo). In case you're wondering, Phoenix actually was the first-place dog that day. How it's different: SpectaSport gives competitors (and their families) a way to see detailed results (including race place, age group place and gender replace) as soon as they finish. Old-fashioned timing companies still make runners wait half-an-hour for a summary list of times to be posted on a piece of plywood. Why it's important: Because SpectaSport has instant results, we can correct errors instantly. Every race has database errors. Family members wear each others bibs by mistake. Genders and ages are incorrect. Names are misspelled. All of these things can have a significant effect on who gets awards. SpectaSport corrects them immediately, so that the you give awards to the right people - the first time. Since old-fashioned timers don't even post their paper results until it's almost time for you to announce your awards, there is no opportunity to correct them. How it's different: SpectaSport's online race results update automatically on the race website and your organization's website through a link we give you in advance. 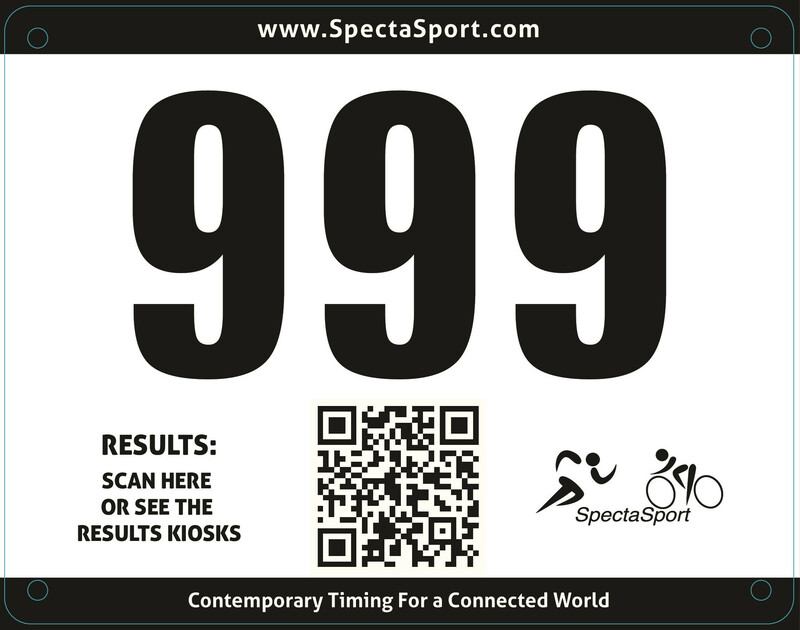 SpectaSport's online race results update automatically every couple of minutes during the race. Runners can even access the online chip timing race results at the race by scanning the QR code on their bib with their mobile phones. We even provide the bibs for you. With SpectaSport, it all happens automatically. Many old-fashioned timing companies make you, the Race Director, rush home after the race and figure out how to post the results on your website. And those other timing companies often take days to post the results on their own websites. Why it's important: As a Race Director, you have enough to do. It shouldn't be your job to figure out how to post results on your website after the race. With SpectaSport, when the race is done, your job is done and you can enjoy the rest of the day. More importantly, runners don't want to wait until Tuesday to see results for a race that took place three days ago. To quote blues legend B.B. King, "The thrill is gone". Can you imagine a youth soccer tournament where they don't tell the teams where they placed until the Wednesday of the following week? Old-fashioned timers do it all the time! Even in the days before internet, sports scores were published in newspapers the following day (not three days later). How it's different: By emailing the awards report to you, SpectaSport saves valuable time. Old-fashioned timing companies waste 10-15 extra minutes printing the report and then tracking you down to give it to you (and it's probably not correct anyway because they only just posted results for the runners on a piece of plywood a couple of minutes ago). We can email the awards report to as many people as you want, even your race announcer, if you have one. Why it's important: Runners don't want to wait 3 times longer to get their awards than it actually took them to run the race. Everybody is busier than ever and wants to get on with the rest of their day. Importantly, printers are the weak link in any network and require more electricity than the rest of the electronics combined. By emailing the Award Report to you, SpectaSport eliminates a significant source of hardware failure. It also allows us to be more environmentally friendly by having a paper-free environment and using a smaller generator than otherwise would be needed. © 2019 SpectaSport LLC. Powered by RunSignup.